Hello everyone, I am Vincent de Bode from Holland. I can speak and understand French and German, but writing it, is difficult for me. English is easier, but it is still a foreign language for me, so excuse my mistakes. 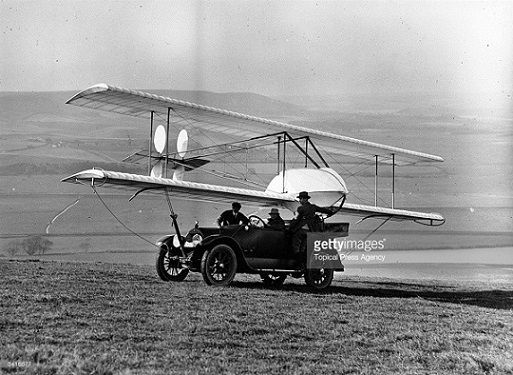 I liked to join Congres Vauville 2017 very much, so I was looking for a suitable glider. We tried to get a proper set of plans, but till now we didn't succeed. I am quite sure when it is finished, the drawings show up . I hesitated a lot where to put this story, in "Constructions détaillées en Photo" or "Constructions Métalliques". 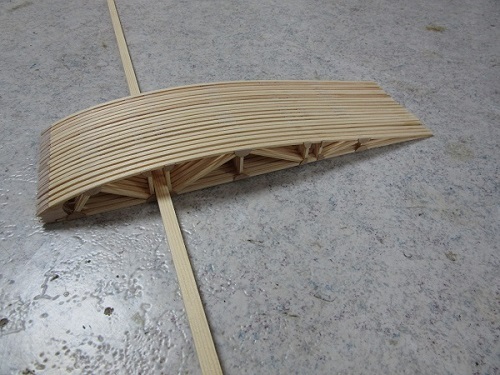 About 70% of the fuselage is steel tube, combined with wood. 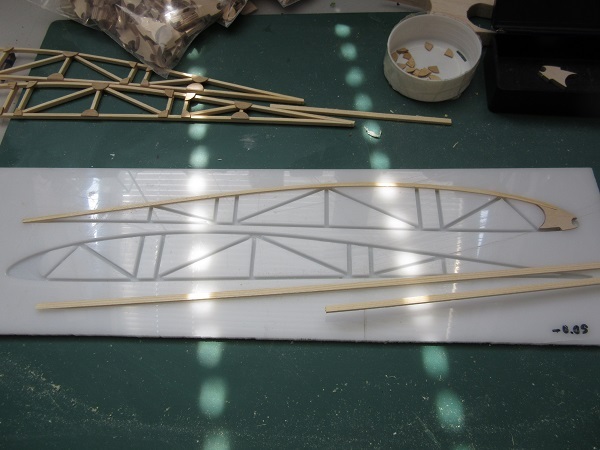 The horizontal and vertical tailplanes are also from steel tube, so I put it in "Constructions Métalliques". When looking at different photo's and (very short) video's (all on the net) I discovered he made a lot of changes on the plane. 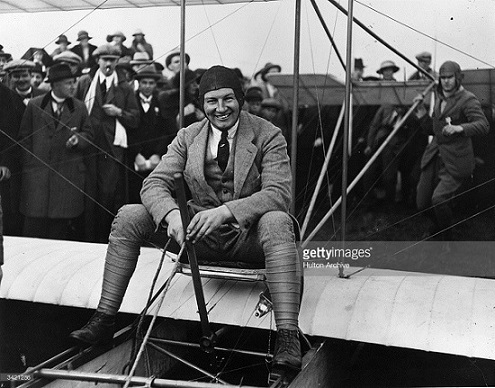 I started to read a lot about Anthony Fokker to get an idea how he constructed aircraft. It was great fun and I even discovered I was at the same secondary school (a lot earlier) and I even recognised the old fysics classroom on the movie of his live. Next story is a mostly guesswork combined with facts and analysing photo's and video's. 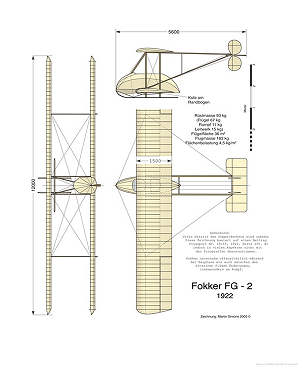 Fokker went to the Wasserkuppe in 1922 with two gliders, the FG-1 single seater and the FG-2 double seater. A reporter writes that they were build in 10 days!!! 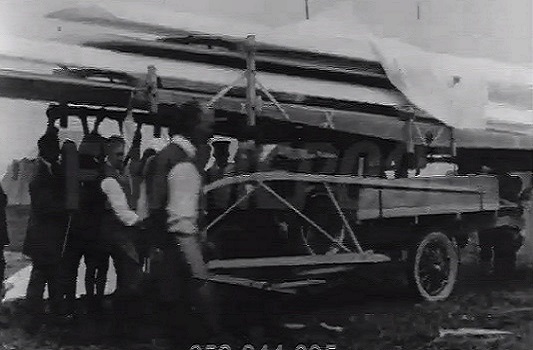 The wings are in one piece, here on a transport craddle on a truck. 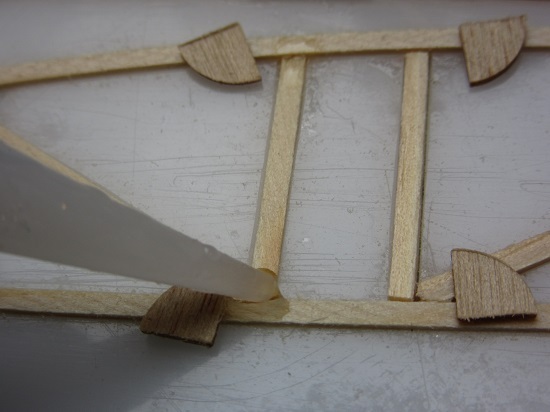 Also visible the internal nose construction with the skid. And the FG-2. 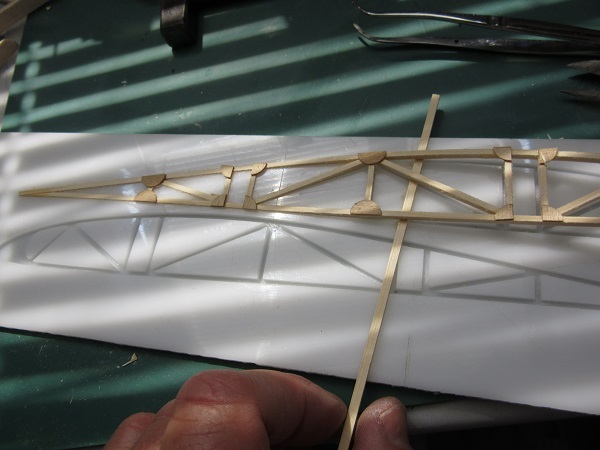 On top of the rear centre vertical strut is the pully for the wing warping. 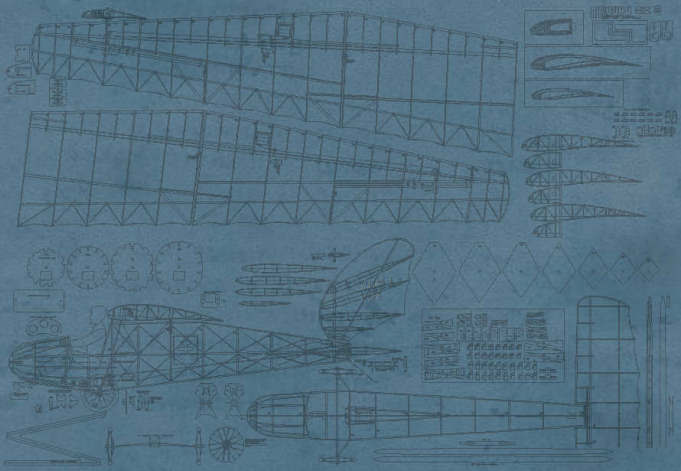 One of the drawings I found, which showed ailerons! 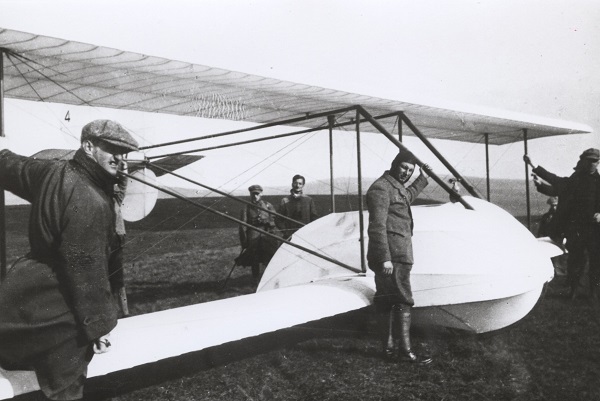 I guess he had control problems partly because the plane had a very short tailboom (I discovered that much later) First change was enlarging the vertical tailplane. 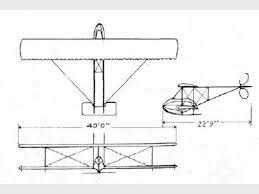 Another drawing I found, with enlarged vertical tailplane, but the tailboom not correct. I think the tailboom was far too short, on one video it looks he is not very good in control, tries to land , but stays in the air, people are a bit running away. On most photo's someone is lifting the tail, or they put with a pole under it, it is a bit hidden, look carefully! Maybe also the cg was to far aft??? So they made a longer tailboom, added a tube frame to stiffen the tubes, made the nose longer and changed the steel tube/ canvas streamline nacelle. 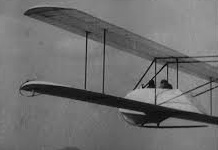 (I read a story from him that they changed a prototype of one of his fighters in one night, made the fuselage longer). One of the best photo's I found. I think he flew succesfully with this configuration. 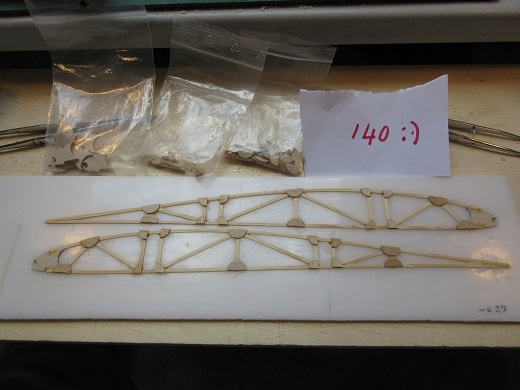 but I found again another photo, with ailerons! but is a very informative picture. I tried to make a drawing, it's a lot of guess work. 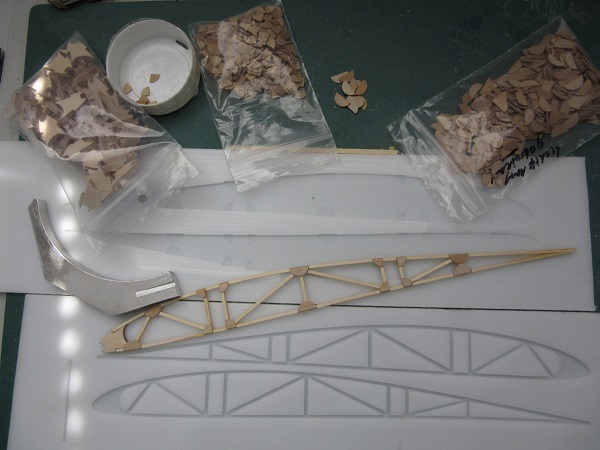 It helped to see how his planes where made of wood and steel , bolted together and lots of wire. 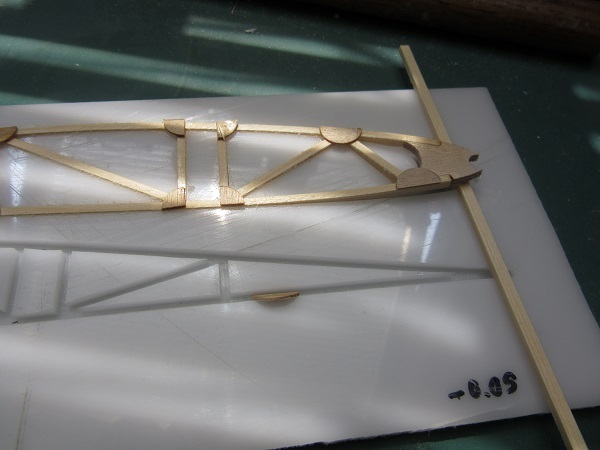 The wing looks very transparant, so I have to make "nervures aux baguettes". Rob came up with the idea to make the wings in three parts. 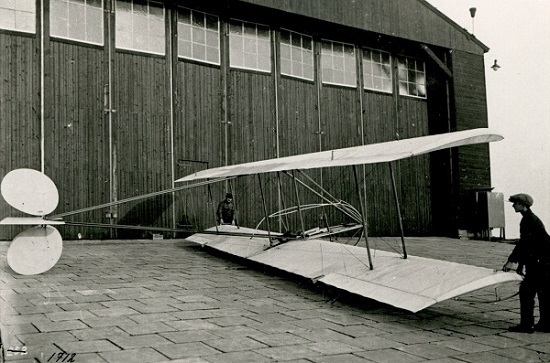 One short piece connected to the fuselage and two outer parts demountable for transport. 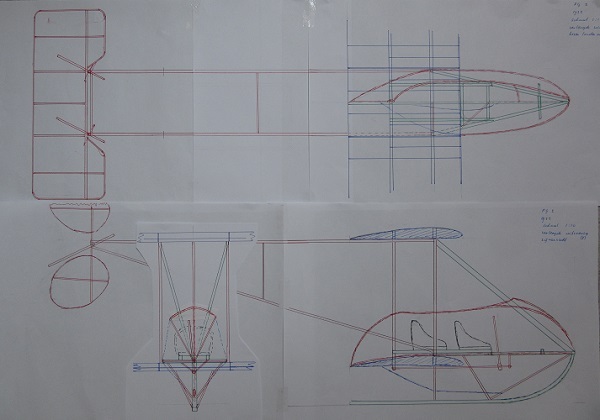 On the drawing I made(it is more a scetch) red is steel tube, green is wood, blue the wing and canvas. 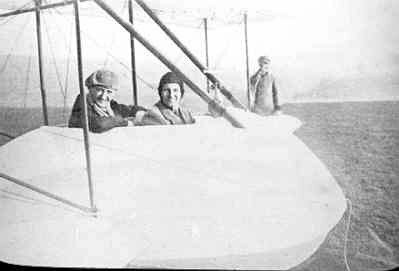 Back to the ailerons (or lack of them) Fokker had a lot of experience with wing warping and obviously this plane had it. 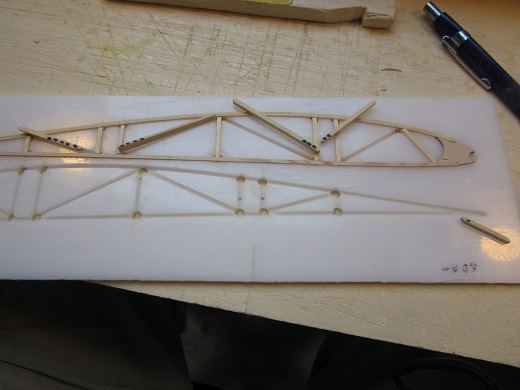 The front girders with the struts and cross rigging, combined with rigging to the nose and tail should made it rigid. Rigging in green. The rear girder was only attached in one point (the rear strut, it had 3 struts in the middle instead of 4). 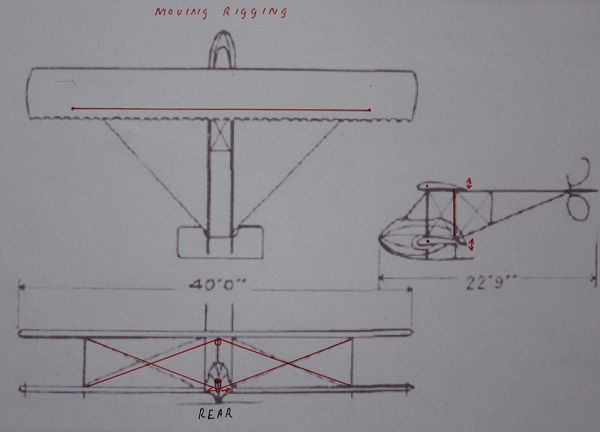 On top of the rear strut is a pully and at the bottom of this strut must be a connection to the torsion tube of the control , which is under the wing. In the model comes a big servo, about the same as the Willy Farner from Fréderic. His building story is very helpfull! 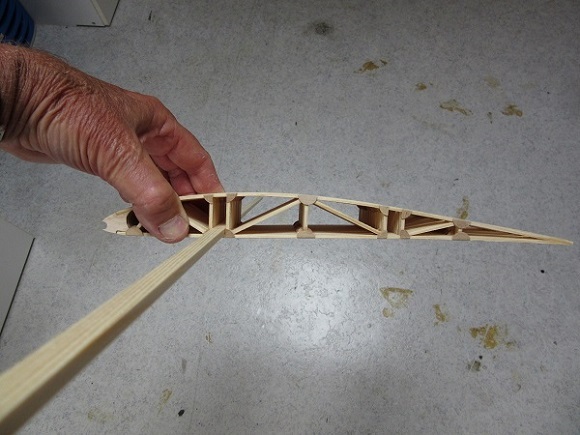 Because the rear girder is resting on one point there should be no bending in the rear girder when the wings are warped. 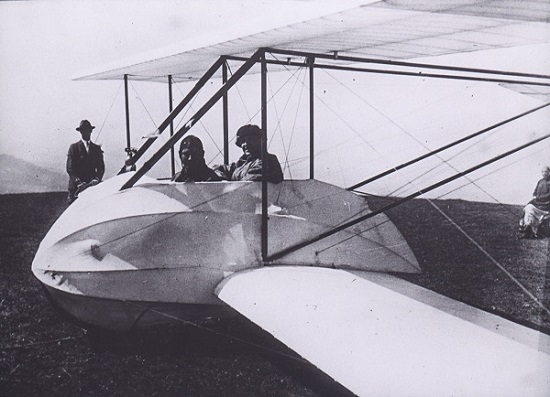 The photo in the beginning of this article from the FG-1 gives an idea of the controls. So, this was a lot of puzzling, I can now start building. I think I am going to make all the ribs this summer, Adri is going to CNC a aluminium jig to make the ribs in, something like 80! 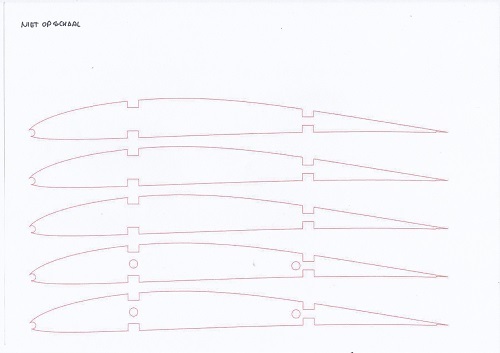 Pour les biplans, triplans... je me demande si on aurait pas pu réduire l'envergure à 2m, ça fait déjà une belle taille, enfin ça dépend aussi de l'échelle. A 2m ça ferait au 1/6e c'est encore bien pour les détails. Merci Vincent et Wolfgang pour les comments! Quite suddenly I started with the ribs. 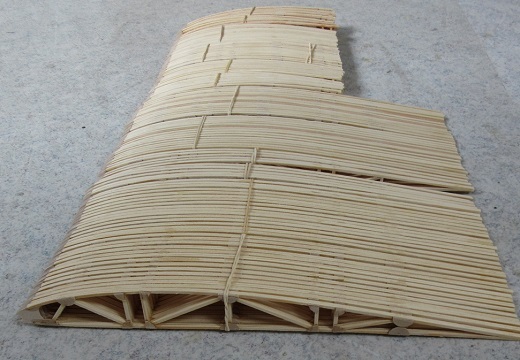 I thought to make them of battens 2 mm X 3mm spruce with gusset plates from 0.8 mm ply and a nose section from 3 mm ply. 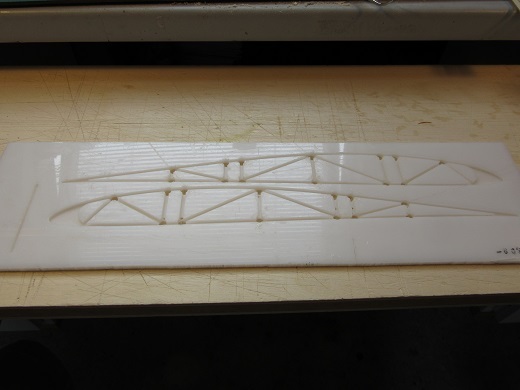 Adri had some spare time and so he could CNC the jigs for the ribs. 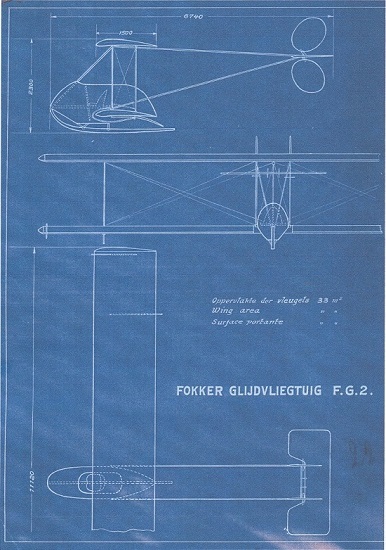 One of the easy things on the FG-2 is that the wings are straight, so alle the ribs are mor or less the same. 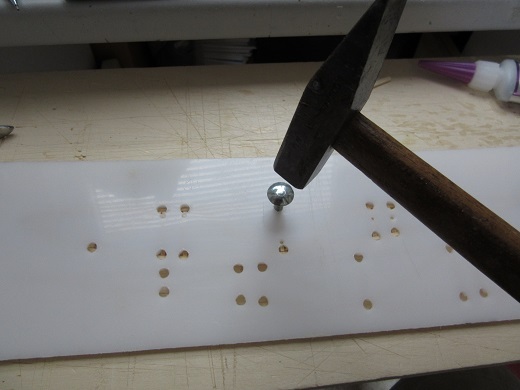 So it was a good idea to make a jig. At that time (I made a stupid error) I thought I needed 80 ribs, later I accidentely discovered I needed 140! We first thought of milling them out of aluminium, but after some thouhts and discussions we got the advice to make them of Delrin, a kind of plastic which looks and feels the same as nylon, but is much better for milling. At a local shop I could buy a piece of 10 X 100 cm and Adri started milling. Before he started I tried to glue a piece of wood on the Delrin with cyano and indeed it didn't stick at all! 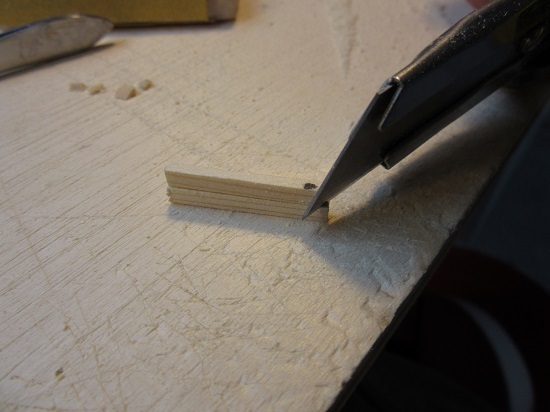 He proposed to make the jig 2mm deep, so the ribs will protrude 1mm, good for sanding and get it out of the jig. On the background all the milled pieces, gusset plates and nose sections, at tis moment for 80 ribs. in total I need 710 halfround and 1120 quarter round gusset plates. 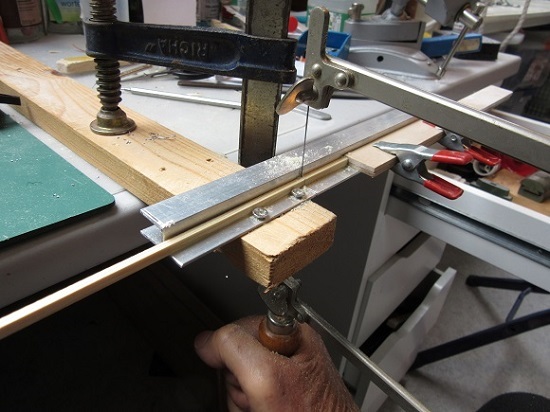 The aluminium jig is for making th tailpiece, and Adri milled two jigs, for left and right ribs (the gusset plates are only on one side) I two days I made some 20 ribs and now my hands are a bit tired! First I continued with the ribs and I tried to speed things a bit up. I wanted to have it finished before the holydays. 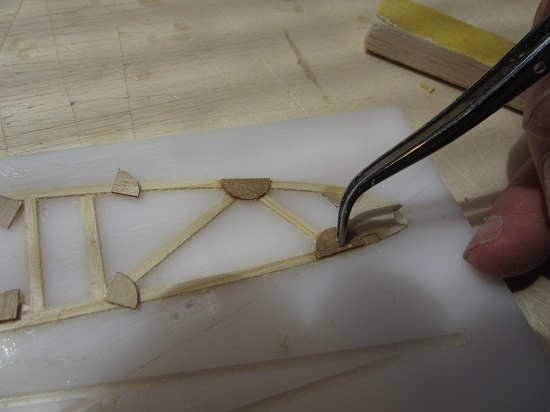 I made an adjustable jig to cut all the vertical and diagonal trusses to the correct lenght. I slowly realised the amount of work! All these bits have to be glued! 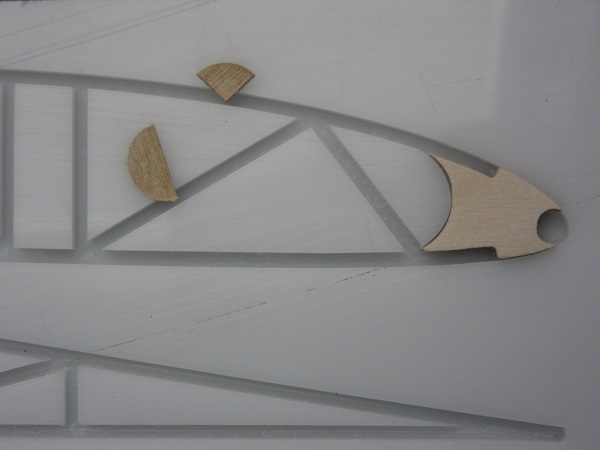 This is how I cut the diagonals. 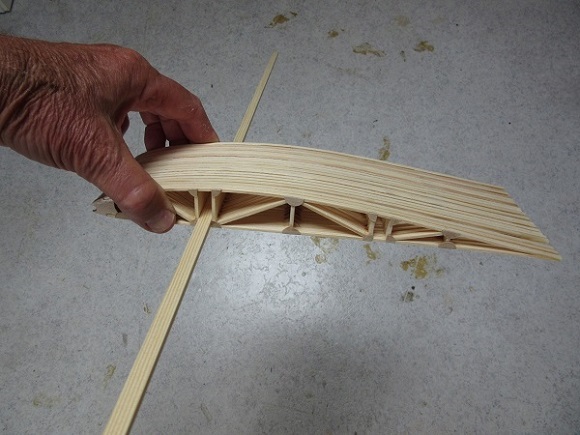 Some of the top and bottom battens had to be sanded down to fit into the jig. 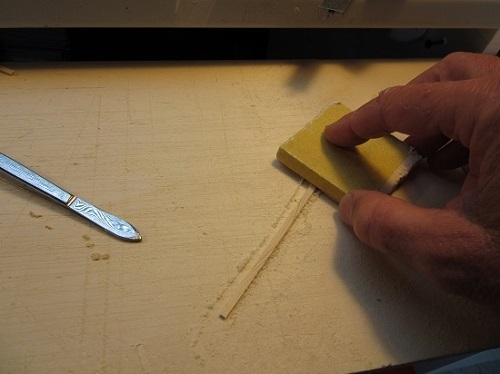 This is my favorite sanding block, 10mm balsa with self adhesive sandingpaper.
. One drop of gap filling cyano and directly I put the gusset plate on his position. The last one Adri calculated it, 3784 actions! 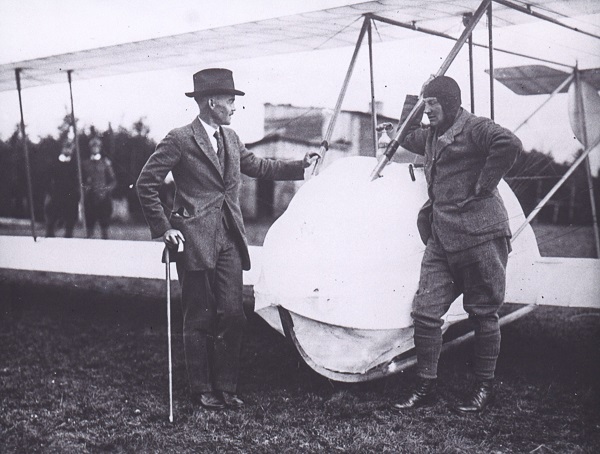 In the meantime I did some more research and I contacted the Aviodrome Collectiebeheer. They quickly answered me and mailed a plan! Wonderful! With handwritten text, very good. 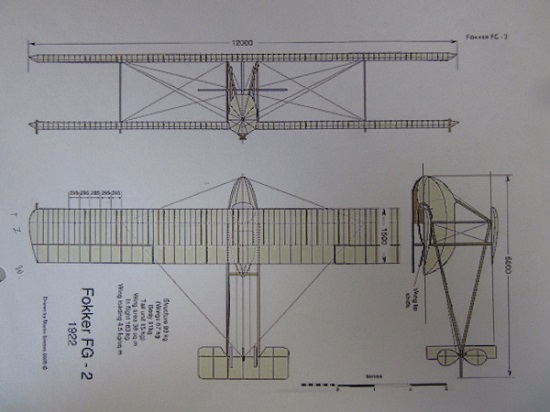 This drawing had some very interesting measures, the height (which I had almost correctly got from the fotographs) and a different wingspan, (11.20 m instead of 12 m). They also gave me the name of Hans Disma, who has a archive. I mailed him and he send me the same plan and some very interesting stuff. 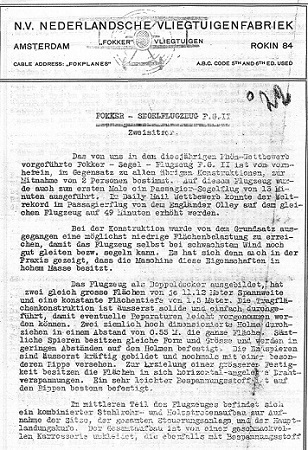 First a German article which mentioned the same wingspan (11.20 m) and also a description of the qualities of the plane; they thought that it was more a floater, not very suitable for soaring, due to the low wingload. 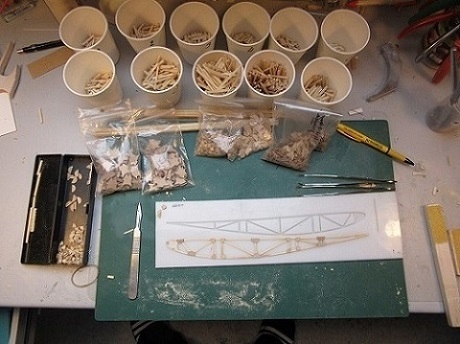 In this article the spacing of the main spars in the wing was mentioned (55cm), we had estimated that correct! The other thing he send was a wunderful and very informative picture. This is a gem! 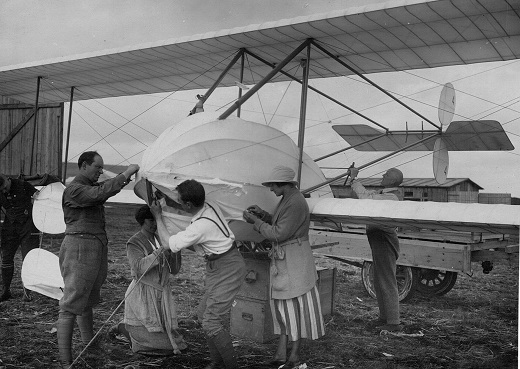 There are so much details; I think it was taken at the Wasserkuppe, the FG 2 standing on some crates on the left someone is taken off the cloth of one rudder, I guess to enlarge it, Anthony Fokker with another man and two woman is changing the nacelle. 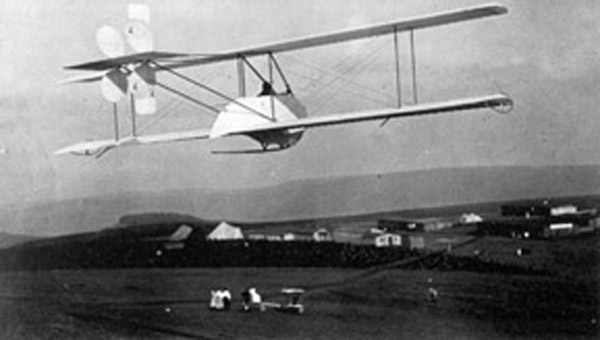 This looks like the first modification, enlarged vertical stabilizer, still a short tailboom and the nacelle hanging over the trailingedge of the wing. Later the nacelle is moved forward and the tailboom lenghtened. 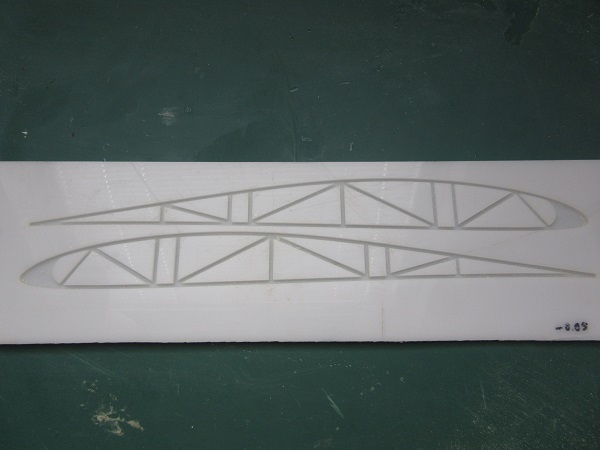 This picture gives a very good image of the wing and I detected internal crossbracing. 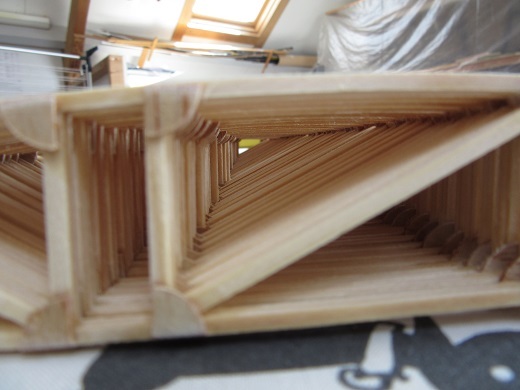 Also good visible is the thickness of the spars and I think I drawed them to bulky. 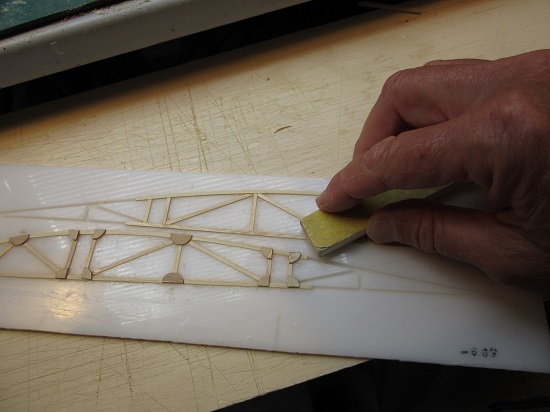 In the model (and already in made the ribs!) 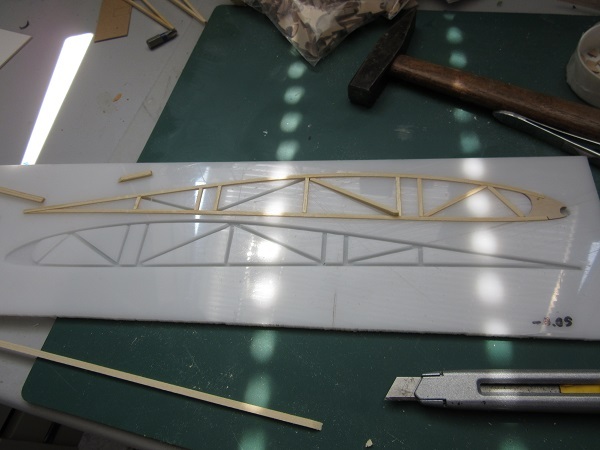 they were planned for 8mm thick, and I think they should be something like 4mm. It means that the apertures in the ribs are to big. Luckily you only will see it when you look into the wing. The thing that worries me a bit are the planned joints in the wing, but it's very impractical to make the wings in one piece. Something to breed on! marvelous technic for building ! It is always very encouraging! Vincent, I like your ribs. Wonderful! was für ein Profil hast Du genommen? Rob hat es gefunden, das profil ist: Eppler E174.